Why just watch the game when you can play one too? Give your guests plenty of reasons to cheer with our picks for the top five football party games. Football bingo is a great activity for all ages. While guests watch the game and commercials, they can mark off the different images they see on the screen on their bingo cards. The first one to get five across, vertically, or diagonally wins! Get our free downloadable bingo cards now: bingo card for player 1, card for player 2, card for player 3, card for player 4, card for player 5, card for player 6. This drinking game will ensure everyone stays engaged with what’s happening on the field and has a great time, even if they don’t normally care about football. The rules (based on how your team performs) are below. Just remember: Please drink responsibly and assign a designated driver before you start playing. Before game time, up the stakes by having everyone choose a player at random: Set out two bowls, one for each team, then write down star players’ numbers on slips of paper and add them to the appropriate bowl. When guests arrive, have them pull out a player from their team’s bowl. The lucky guest who picks the game’s MVP and/or the player with the most points scored, total yards, or interceptions wins. Print out this handy grid. You have 100 squares to sell to your guests. Choose a price and let people buy as many squares as they want, but you’ll need to sell all 100 squares. Pass around the blank grid and let people put their initials in all of the random squares they bought. Once all the squares are filled, pull numbers from zero to nine at random to designate the order of the numbers that go along the left and the top of the grid. You’ll want to make sure this is done after the squares are filled and randomly to keep people from only picking the squares with 0s, 3s and 7s. At the end of each quarter, the person whose initials are in the square that matches the last digit of the teams’ scores wins. 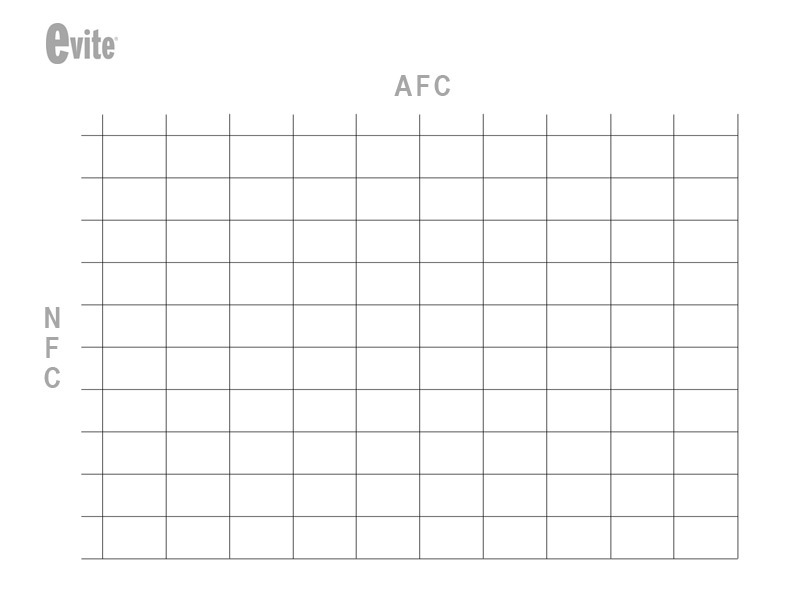 So if the score at the end of the first quarter is 7 points for the NFC team and 3 points for the AFC team, you’ll find the square that coordinates to the number 7 on the NFC line and the number 3 on the AFC line. You may want to split the pot into percentages so that the final score winner gets more than the quarter winners. For example, the winners of the first three quarters get 20 percent of the pot, and the winner of the final score gets 40 percent of the pot. P.S. No matter what games you play, don’t forget about prizes! A few ideas you can run with: a foam football, a sports bar and/or sports store gift certificate, and/or a six-pack of beer from each team’s city. NEXT: Check out more football party ideas!